Established in 1984, Xtrac is widely recognised as the worldwide leader in the design and manufacture of transmission systems. The company supports a wide client base covering top level motorsport, transportation, defence and marine. Xtrac remains a privately owned company and is dedicated to a policy of continuous improvement; this is supported by personal development plans for key staff members and a well-funded capital expenditure programme. The close relationship between design, production engineering and manufacturing ensures that Xtrac is able to manufacture even the most complex components, whilst a continuing commitment to researching new processes and manufacturing techniques has enabled the development of enhanced product designs. The nature of the company’s customers means that demands for short lead times and unmatched quality standards are everyday Xtrac challenges, whilst the ability to manufacture and inspect components entirely in-house is vital in satisfying both challenging demands. Neil Warwick, Xtrac Inspection Manager explained: ‘The consequences of failure in the field of Xtrac’s manufactured components means that quality permeates every aspect of the business, from administration systems, through the development of our advanced manufacturing techniques, to the company’s state of the art product inspection facilities. “To guarantee the delivery of premium quality products, in addition to operating several Coordinate Measuring Machines and many other advanced inspection aids in our final inspection department, each of our production operators takes responsibility for the quality of their own work. To ensure that production personnel are able to achieve the required levels of accuracy, and that they are able to undertake the necessary range of inspection tasks, we supply them with the best available inspection equipment. “Although we ensure that our shop-floor conditions are kept in a pristine condition, given the presence of machine tools and other equipment, we have a challenging requirement for inspection aids that can stand-up to the demands of continued shop-floor use, yet provide inspection department levels of precision. “Some time ago, we undertook a search for an easy to use, multi-functional, accurate height gauge that could be used with confidence within our manufacturing areas. We found the answer in a Trimos VL300 from Bowers Group. As the robust height gauge proved to be ideal for achieving high precision results on the shop-floor and was also popular with our production operatives, we soon ordered a second Trimos VL300. “The reliable nature and the outstanding accuracy of our original Trimos height gauges has resulted in the purchase of further models over several years. Our most recent Trimos Height Gauge purchase was prompted by a substantial increase in production and our need for a series of smaller capacity, relatively simple, yet accurate, shop-floor height gauges. 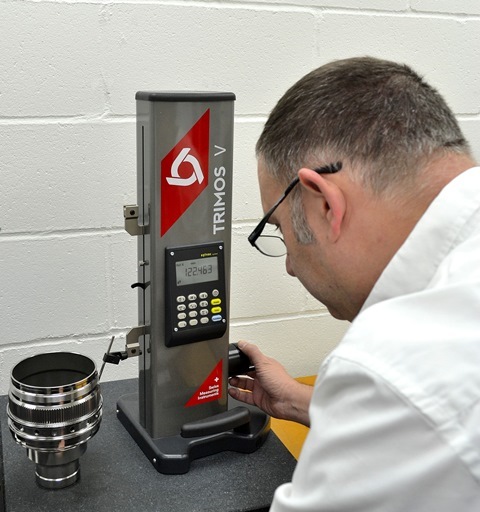 Trimos VL Series Digital Height Gauges provide laboratory standards of precision to the shop floor and are ideal for use in close proximity to machine tools. The height gauges’ logical operating system and speed of use guarantees a short operator learning curve and ensures that new users are able to perform all required measuring tasks within the cycle times of machine tools. Ease of use is further aided by the gauges’ use of a rechargeable battery pack. An ingenious Trimos measurement activator ensures excellent standards of accuracy and repeatability and also provides outstanding reproducibility of measuring results from operator to operator. A simple VL300 built-in keypad gives access to all functions, whilst a large digital display shows the achieved measured values. If required all measured values can be downloaded via an RS232C data output. Amongst the numerous precise measuring tasks, the VL Series height gauges are able to perform in a metric or inch mode are - step heights, internal / external diameters, surface and centreline distance measurements and zero setting to a preset value. Neil Warwick, concluded, “To help meet all of our quality aims, Xtrac is totally committed to developing our employees, customer relationships, technical capability and continually improving the effectiveness of our quality management systems in line with the requirements of ISO 9001:2008. We regard our suppliers as a vital part of our business and constantly strive to promote and improve relationships with our suppliers. This policy is typified by the excellent relationship we have established with Bowers and our outstanding experience we have had with our many Trimos height gauges.